November 22 in North America will be a gamer's dream come true. Not only is the Xbox One releasing then, but so is Super Mario 3D World and this game, The Legend of Zelda: A Link Between Worlds. It's shaping up to have the glorious old nostalgia of A Link to the Past while implementing a wide array of new to keep things fresh. Check out the trailer and see for yourself! Do plumbers dream of electric wrenches? We don't know, but we do know that we have an all-new review to share with you. 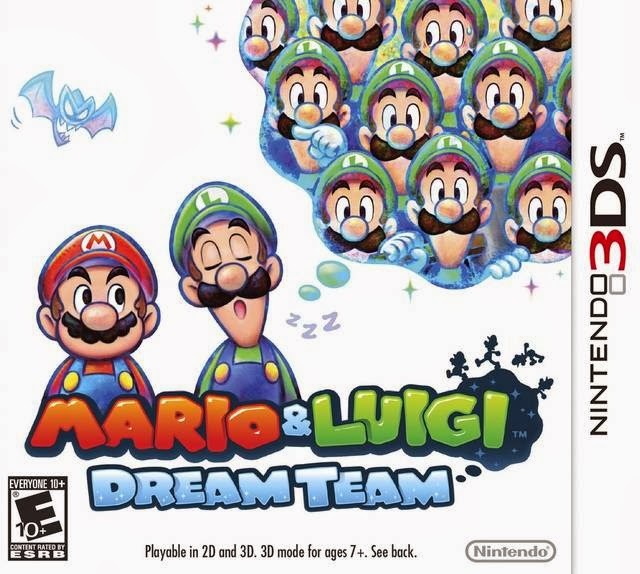 It's Mario & Luigi: Dream Team for the Nintendo 3DS, written by staffer Bean. Mario & Luigi: Dream Team is not only a part of The Year of Luigi celebration for his thirty years as a character, but it also marks the tenth anniversary of the Mario & Luigi sub-series. Unlike with the other RPG branch of the series in the Paper Mario games has in recent entries, Dream Team rarely strays from its roots, so those that were worried that this new Mario & Luigi game would take a similar drastic departure like Sticker Star did can put those fears to rest. No, Mario & Luigi: Dream Team is both a terrific entry in the series but also one of the best RPGs the Nintendo 3DS has to offer. The story throws the good guys into a soon to be ill-fated vacation destination at Pi'illo Island, a land that is said to have a special power on the island that encourages people to sleep. It also used to be the home of the ancient Pi'illo Kingdom, but it seems like they were all wiped out due to some unrevealed circumstances. Well, it doesn't take long for the new face of evil to show himself and make his presence felt as well as finding out that rumors of the Pi'illo Kingdom's denizens have been greatly exaggerated. Yes, Mario and Luigi are back to go through both the waking and dream worlds to get through their newest adventure. 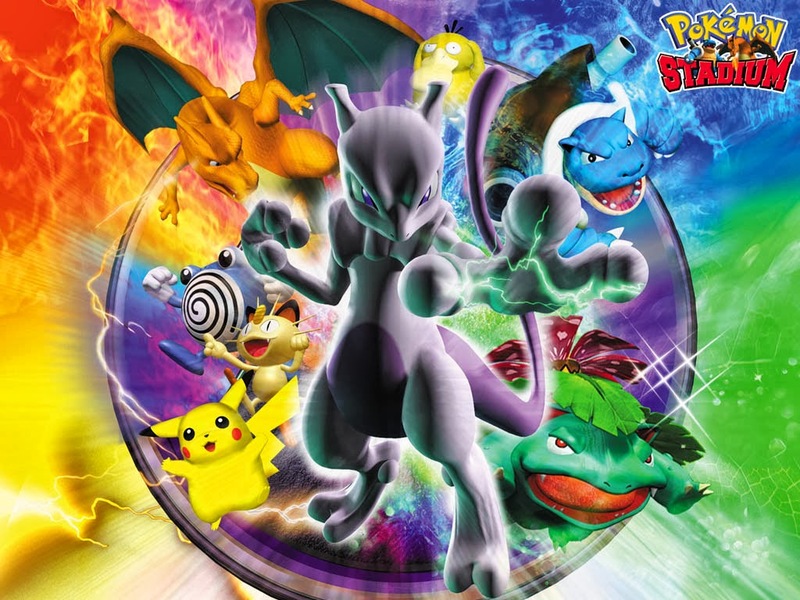 It's because of the two different worlds to explore that the game is very much like the previous entry in the sub-series, Bowser's Inside Story, but make no mistake. Dream Team dwarfs the amount of content that was in BIS and by a good margin to boot! Pi'illo Island is the setting of Dream Team. On overworld maps and dungeons, Mario and Luigi are partners in everything they do. each plumber is assigned a button. One button makes Mario jump, while another makes Luigi jump. 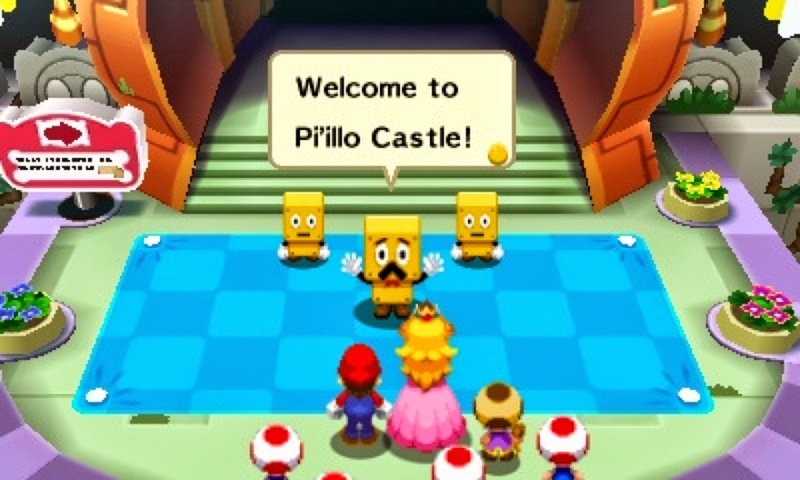 As the game progresses, Mario and Luigi learn new abilities, allowing them to access areas they could enter or reach previously. One move allows Luigi to smack Mario with a hammer. On solid ground, Mario flattens like a pancake, able to enter small doorways. 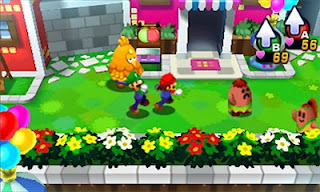 On soft ground, Mario gets knocked underground, able to move around the soft soil and pop out of the ground, obtaining buried items like stat-increasing beans. Those stat-increases are necessary when you enter battle. Every unscripted battle can have Mario or Luigi get the first hit on a foe. It can be as simple as leaping on an enemy in the overworld, catching them off guard. However, the same thing can happen to our heroic plumbers. Getting caught from behind means the enemy or enemies for that battle will get a first attack. your toilets will never flood! Battles pretty much work the same way as the very first Mario RPG, Super Mario RPG: Legend of the Seven Stars. 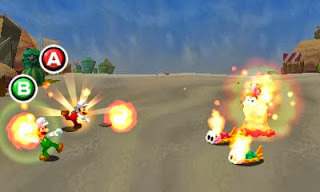 Through timing of button presses, Mario and Luigi can dish out heavy damage to enemies, as well as dodge baddie attacks. For instance, if you hit the attack button right when Mario jumps on a foe's head, you'll score another opportunity to bounce of its head, dealing more damage. Mario and Luigi also need to be on the defensive, dodging attacks through leaping over enemy advances at just the right time or using their hammers to ward off foe strikes. It's a proactive battle system that makes even the weakest of battles seem interesting to fight. Moreover, defending enemy attacks with the hammer is much simpler as one doesn't have to worry about the hammer head falling off if you mistime your strike. I find this to be a welcome change considering there are many attacks where you'll have to counter a foe more than once, sometimes even a whole group in their turn! Bros. Attacks return from past games. These super powerful assaults on enemies have both plumbers teaming up to attack foes. One such attack has Mario and Luigi kicking a shell back and forth between one another. 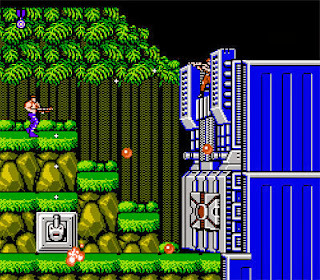 Each successive shot becomes stronger and stronger until the final blast into the baddie. Another Bros. Attack grants both plumbers fire flowers. As the fireballs from each plumber reaches their largest, the player must shoot them at the enemy before they extinguish. Successfully shooting off all fireballs at the largest unleashes the most pain to their targets. 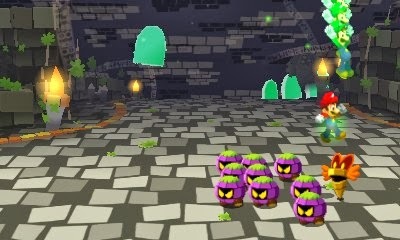 The "Dream" part of Mario & Luigi: Dream Team alludes to the parts of the game where Mario enters into Luigi's dream through a plethora of pillows that are sprinkled throughout the game. These sections split up the gameplay nicely, as instead of being a fully 3D area, these environments are strictly 2D affairs, again similar to being inside Bowser in Bowser's Inside Story, making platforming more important than ever. to help Mario in the dream world. 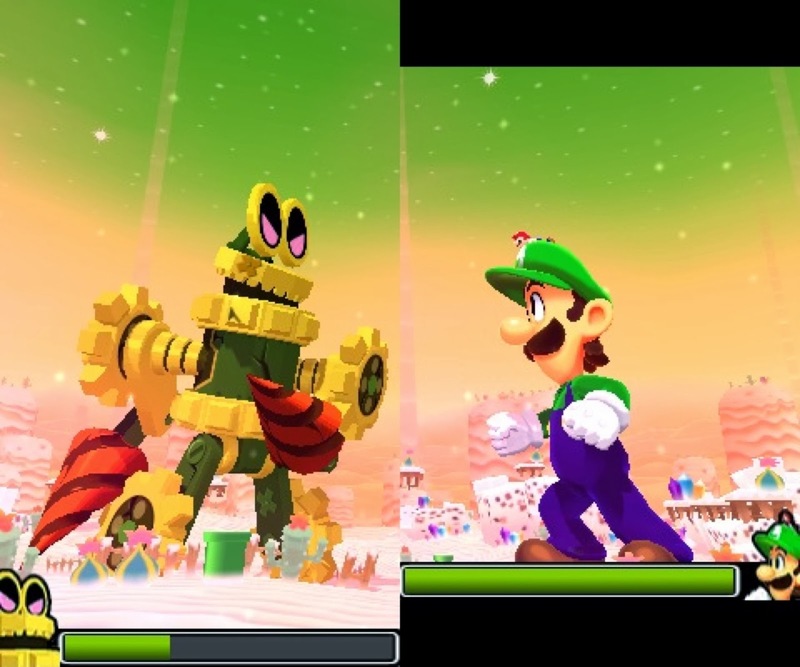 In these dream segments, a dreamy Luigi joins Mario while the real world Luigi rests on the bottom screen. Interacting with the touch screen's Luigi affects the dream world in different ways. For example, playing with Luigi's nose causes him to sneeze, thus moving and twirling once unreachable platforms for Mario and dreamy Luigi to access new heights and areas. 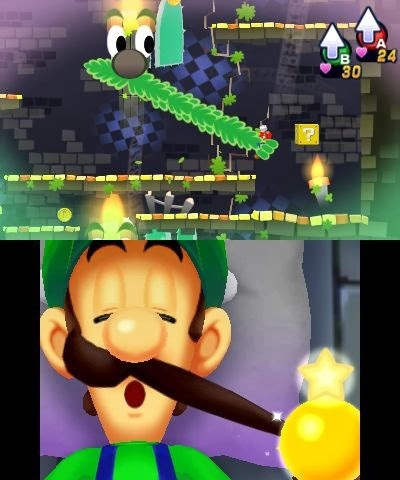 Just like on the overworld, there are plenty of abilities called Luiginary Works for Dreamy Luigi to use. Some areas will have you rescuing trapped Pi'illo folk inside that has Mario finding ways to reach and smash Nightmare Chunks, but there's usually trouble to be found in these parts as well. Battles in the dream world work differently than their real world counterparts. Dreamy Luigi's aura surrounds Mario, enhancing each attack the portly plumber lets loose. A mere jump attack from Mario has a multitude of Luigis crashing down on a cavalcade of foes. A heavy-handed hammer attack from Mario unleashes a wall of Luigis who slam their own hammers down, doing even more damage to a group of foes. Luiginary Attacks take the place of Bros. Attacks in the dream world. 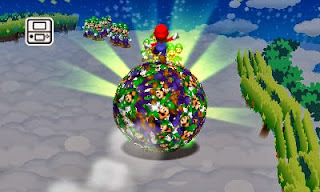 Some have the player tilting the 3DS as Mario controls a ball, doing his very best to roll over as many Luigis as possible to release a massive attack on baddies of all shapes and sizes. to form a powerful ball of green. Speaking of all shapes and sizes, there are a handful of battles that have you taking control of a giant Luigi. These battles have the player turning the 3DS on its side so each combatant has a screen to themselves. At first, you can only jump, swing your hammer sideways (which will knock an enemy into the background), or heal up courtesy of a timing mini-game. 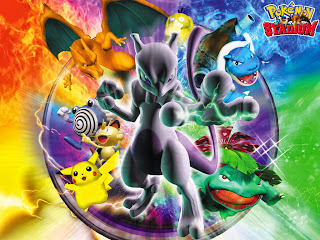 As you enter new battles, more moves will become available such as swinging your hammer upwards (to knock a foe straight back) and another team up move that has you making a circular motion in the direction indicated on the 3DS screen. To cap off a fight, one must guide Mario who is riding on a star into the enemy. This is done by tilting the 3DS in the proper direction to line it up with the star on the enemy's head. It all sounds great, but there are some issues in this battle system. This really came to fruition against one of the middle Giant Luigi battles. In this fight, you have to time your attacks or dodges almost to the quarter of a second. The problem is that the controls weren't always as responsive as I would have liked in this instance, and I would get hit even when I was making the correct swipes with the stylus to fend the boss off. Even worse, this battle not only wound up freezing on me but a friend as well because the game couldn't decide whether or not to shift a camera angle to the right place. 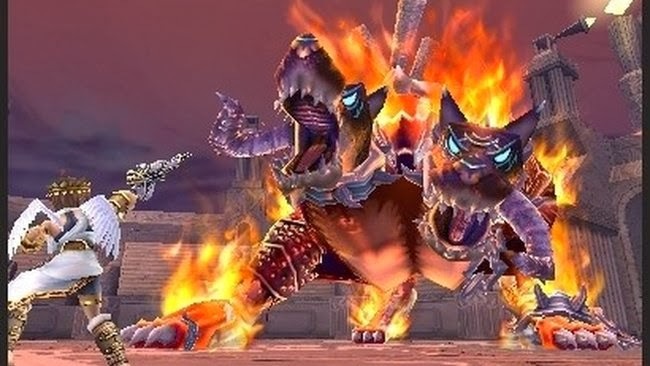 It was easily the most frustrating fight of the game as future giant battles didn't have these issues and in fact wound up being fun, but I can't overlook that huge flaw. For getting through the real world and dreamy battles, you'll earn experience which will give you the usual level up bonuses. Just like with previous entries in the series you also get to pick which of the six stats (HP, BP, Power, Defense, Speed, Stache or critical hits) you wish to give an additional bonus to. If you keep pumping in bonuses to one stat, your chance of a huge increase goes down greatly. Conversely, if you ignore a category for awhile, don't be surprised to see numbers like a 5 or 6 pop up on the wheel. People that can time these will be reaping the rewards quite well. Moreover, at certain levels, you're allowed to pick a level up bonus. These include having an extra gear slot on your character for equipment, one that I highly recommend in the early going, to stat-up bonuses, lowering the amount of battle points needed to use special moves, and so on. There are also in-game battle rewards for the first time in the series. For instance, in each new area you go to, you will be asked to perform ten excellent hits in a row or go through a fight without taking damage from an enemy that must attack you at least once. Some areas and enemies are definitely easier than others, but the rewards are well worth it as every challenge that you can complete will earn you points, some higher than others, and eventually offer you rewards when you gain enough total points. 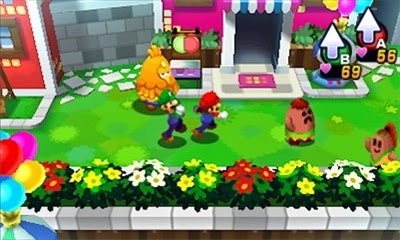 Mario & Luigi: Dream Team is a mighty fine looker and has an overall stellar presentation. The new models for Mario and Luigi, as well as the various other cast members, such as Princess Peach, Bowser, and various enemies look very sharp. Areas are colorful, crisp, and pop out at you when you have the 3D slider turned up. Battles are silky smooth with no frame-rate drops to speak of. On the sound side, Yoko Shimomura has once again delivered a stellar soundtrack that just fits the overall mood of wherever you are. To me, the highlight of the soundtrack are the boss battle beats that just seemed to put a smile on my face. many locales in Dream Team. Another thing that put a smile on my face was the overall humor of the game. Whether in the real or dream world, there are a plethora of characters and conversations that did get some laughs out of me. There are a couple in particular that just seem to totally nail whenever they're talking, especially one that talks in a thick New Yorker style dialect. Even better, he's a character that gets better when you meet him the second time around. You'll know what I mean when you see it. Others come close with a heavy abundance of beef or nap chat, but it's nice to see the writing and translations done quite well here overall. It's a good thing the writing and combat are mostly superb because this game has a lot of content packed in it. Dream Team took me over 45 hours to complete or just about the combined length of the previous three games combined. Sure, I meandered about for a bit in spots, but the areas in this game are pretty huge overall with plenty of combat to go around. Some might say that the combat is packed too heavily into areas or that the tutorials get out of hand, but I really don't see it that way. If anything, my only true gripe with the length came on a quest that sent you back to previous areas to reach new parts in said areas. These parts didn't really last as long for the most part, and it all culminated with that one boss fight I deplored. It's what keeps the game from being the best in the series, but that's a high bar to reach anyway. 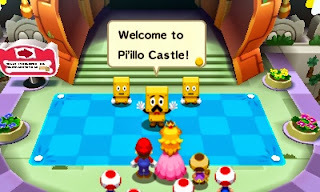 In the end, the Mario Bros. have another outstanding RPG to put under their proverbial belts. 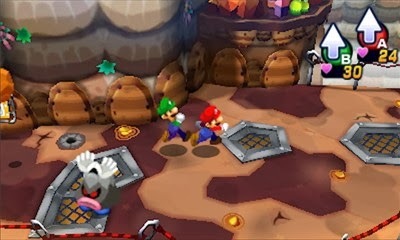 Mario & Luigi: Dream Team is an amazing RPG with multiple battle systems that are fun to play. The game has a lot to offer, and I think most players will enjoy the majority of what Dream Team does bring to the pillow. It's a definite must-have title for a device that feels like it's had must-have titles for the majority of 2013. It might not be the best the machine has to offer or the best in the series, but Mario & Luigi: Dream Team is a game that was an absolute dream to play and yet another gem for the Nintendo 3DS. The Inane Idiocy of Saying "I've Outgrown Nintendo"
One of the most overused and obnoxious sayings I see against Nintendo from their critics is that gamers have "outgrown Nintendo." This is pure lunacy, in my opinion. That's like me saying I've outgrown Disney, despite that company producing and manufacturing content for all ages. What gets me further agitated is some of these same people say they've outgrown Nintendo go on to play what I would consider to be totally immature, albeit very fun and well designed game series like Grand Theft Auto and Call of Duty. I think the most important distinction to be made is that "Nintendo games" is not a genre. By saying this, you're painting with a broad brush, thinking all Nintendo makes is one kind of product, which is completely untrue. It's not like saying "I've outgrown military shooters that are popular online with nine-year-old racists screeching profanities and telling me to have sexual things done to myself." There's a big, not-so-subtle difference here. Nintendo creates games for everyone. Just because some have more color than others does not mean that the game is simply for kids. That's a fallacy that only middle school children should make, and not grown adults. Even still, Nintendo doesn't just make Mario and Zelda, though that is clearly their bread and butter, without question. No, they produce action games like Metroid and Kid Icarus, arcade shoot-em-ups like Sin & Punishment: Star Successor, eccentric sports games like ExciteBots: Trick Racing and Punch-Out! !, strategy RPGs like Fire Emblem, and traditional RPGs like Xenoblade Chronicles. When someone paints with a broad brush and states that they have outgrown Nintendo, that means to me that they've totally ignored everything Nintendo has put out. Nintendo doesn't do one thing and one thing alone. 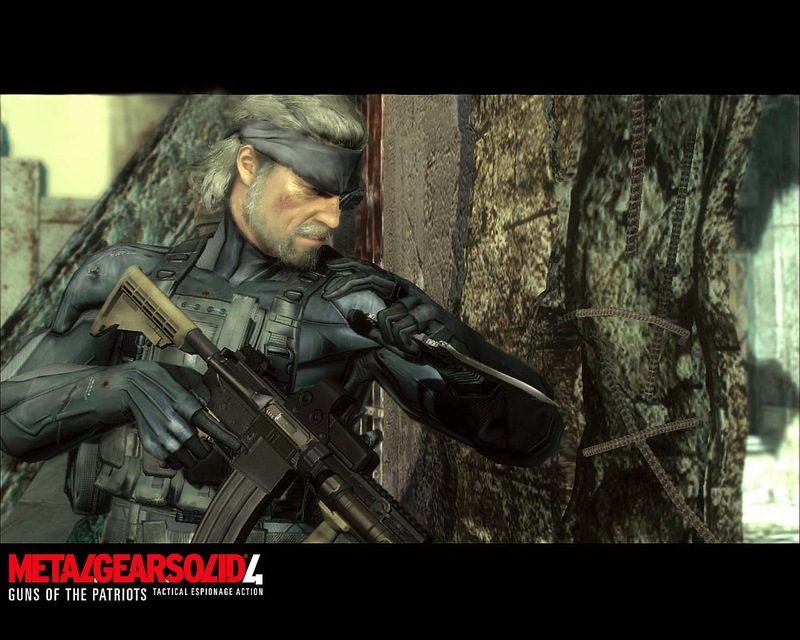 They make a wide assortment of games for a wide assortment of people. If a given person can't find anything that Nintendo produces, then I can't help but think they have an extremely limited taste in gaming. Some argue that the industry has grown up while Nintendo has not. This assumption annoys me, as all I see in the retail space are games that would rather be Hollywood blockbusters than-- you know-- actual games, titles with budgets that are insanely high and have a lopsided risk vs. reward ratio, and a profusion of games with guns. That is not growing up. That is simply a different direction than what Nintendo is doing. To me it's a worse direction, but to others it is what they want out of gaming. Perhaps they think that if gaming gets closer in scope to Hollywood and film the mainstream will take the industry more seriously. However, I'm sure all of the studios that closed this past generation due to only one of their games failing to sell one million copies just to break even wouldn't have minded trying Nintendo's direction if it meant staying alive. parts than a game with cutscenes. I grew up in the 8-bit and 16-bit eras-- the true golden age of gaming. There was great variety in genres. You can't really say that today, where the most anticipated and/or best selling titles are either shooters or sports games. Developers didn't try to mimic Hollywood, making interactive movies under the guise of games-- they knew they were a separate medium than film and treated video games as such. but not the type we see so much of today. Another reason as to why some folks say they've outgrown Nintendo has nothing to do with their games and more to do with company's policies. In a generation where $400 and $500 systems will be the norm with their beastly power, the Wii U, in comparison, has all the power of a kitty cat. These critics who have "aged out of Nintendo" have possibly grown weary of the company utilizing underpowered consoles when compared to the competition. In this regard, they've outgrown Nintendo due to their weak hardware, which is one position I can actually understand. Perhaps I'm simply being a stick in the mud, or showing my age. That's entirely in the realm of possibility. Nonetheless, I've been playing Nintendo's games ever since Super Mario Bros. on the original Nintendo Entertainment System. In an incredibly unstable gaming industry, one constant that I have the pleasure in knowing is that Nintendo will deliver competent, capable, and nearly always enjoyable games. They may take less risks and may be more conservative now than ever before, but the titles they churn out with care and polish still make me smile. In a world where guns and gore, or big blockbuster budget movie-like games seem to be what the industry deems "mature", I'm happy there is still a niche for creative and charming titles in the gaming industry. No, Nintendo isn't the only developer/publisher producing such titles. Far from it. However, they've always been a constant in this regard in their illustrious history in the gaming industry. Unfortunately for Wii U owners, Donkey Kong Country: Tropical Freeze was delayed to February of next year. That said, it seems like a smart idea to do so-- not because Retro Studios's latest looks bad. No, no. It looks absolutely incredible. No, it's because already this year the Wii U is saturated with platformers. To tide over media-hungry fans like us, Nintendo has released this new Dixie Kong-centric trailer for Tropical Freeze. Welcome to the start of the work week here at SuperPhillip Central, and most likely, where you are, too. Today brings another installment of SuperPhillip Central's Favorite VGMs right to you. This week's edition contains music from The World Ends With You, Tales of Symphonia, as well as Pokemon Stadium. It's sure to be an enjoyable edition of VGM for everyone. Let's get started! 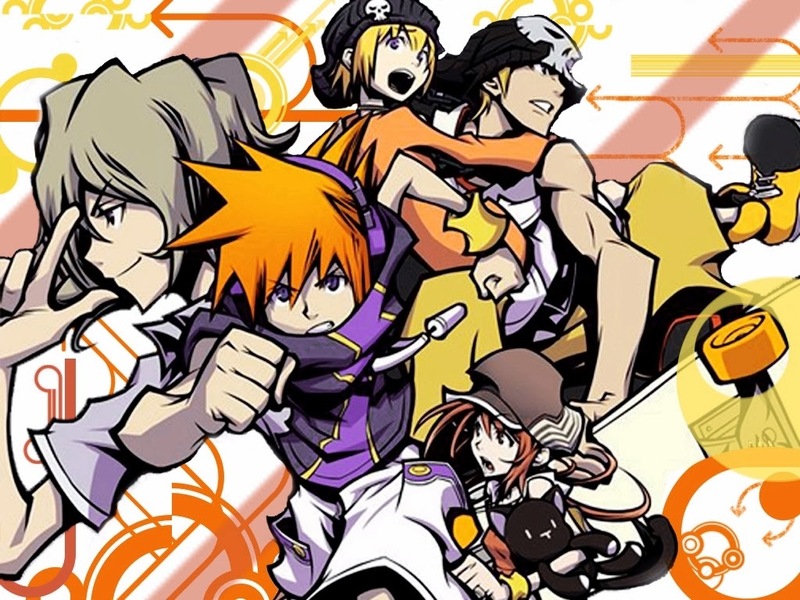 The World Ends With You marked a time in Square Enix's history where they weren't as afraid to take risks. Present-day Square Enix is in panic mode currently, and things aren't looking too bright for the Japanese publisher. Regardless, we can look back at better times for the company with games like The World Ends With You for Nintendo DS. Nintendo's GameCube did not receive much in the way of RPGs. 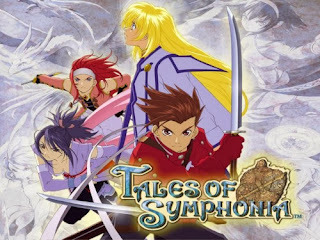 It's a fallacy to say that Tales of Symphonia is only thought of highly because it was one of the few RPGs on Nintendo's system. No, it's thought of highly because the game has a gorgeous art style, an engaging combat system, an intriguing story, and of course, great music. 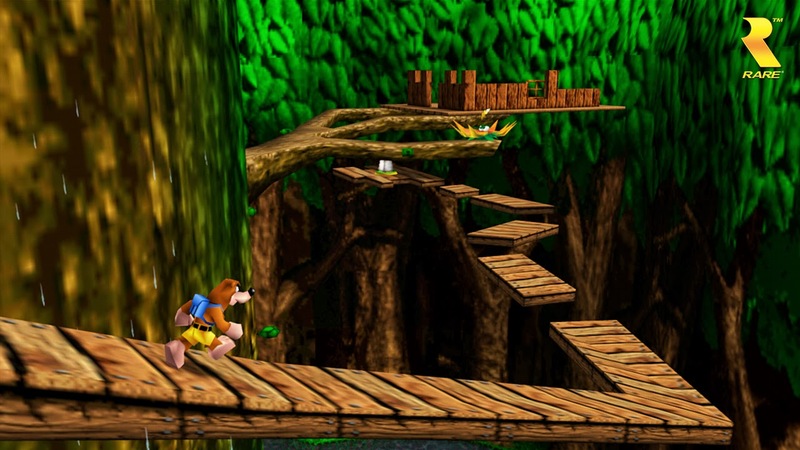 Banjo-Kazooie was an evolution to the formula and foundation that the revolutionary Super Mario 64 laid down. 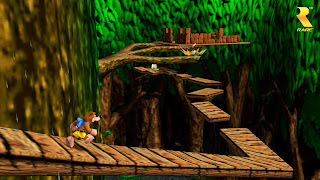 It was a better game for it, though some might not have enjoyed how Banjo and Kazooie's full move set was not available immediately from the start of the game. Grant Kirkhope lent his composition genius to the soundtrack, creating a score that is still amazing to this day. Being able to hear the classic 8-bit melodies from Pokemon Red, Blue, and Yellow on the Nintendo 64 sound chip was a moment that made younger versions of the SuperPhillip Central staff squeal with delight. This particular theme is one of our absolute favorites, and made fighting the likes of Brock and Misty all the more intense. The theme of Wyndia, a kingdom that has appeared in the majority of Breath of Fire games, The Kingdom is a majestic and regal theme. It seems like a great time to bring this game and its soundtrack up, as North Americans last month were able to download the game on the Wii U's Virtual Console service. Definitely check Breath of Fire II out if you haven't. Just be weary of the poor (but occasionally hilarious) translation.